Amy Pond is her name and she is a feisty red-head that is about to get introduced to a crazy new life. 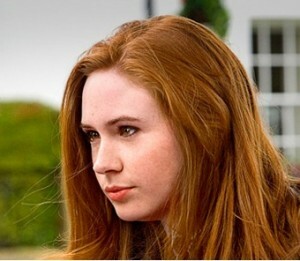 Scottish born actress is Karen Gillan and she plays the latest of the Doctor’s companions, but she is no stranger to the series. Her mother has always been a long standing fan of the show. Also, Gillan appeared on a previous episode of Doctor Who as a soothsayer in “The Fires of Pompeii”. We look forward to her role as the Doctor’s newest companion. Posted: 03|27|10 at 3:51 pm. Filed under: Companions, New Doctor Who.